Space Safety » Archive » Space Debris » Kessler Syndrome » Gravity: Ripped from the Headlines? October 4 is the US release of the space thriller motion picture “Gravity.” Directed by Alfonso Cuarón and written by Cuarón and his son Jonás Cuarón, “Gravity” tells the story of a couple of astronauts, Ryan Stone and Matt Kowalski, are stranded on a spacewalk during a repair mission to the Hubble Space Telescope when their Space Shuttle is destroyed by debris from an unfortunate anti-satellite test. Although its worldwide release is just kicking off, “Gravity” has been featured at numerous film festivals over the past few months to universal acclaim. But “Gravity” isn’t just good cinema: a good bit of this film bears a striking resemblance to real life. “Gravity” astronauts Ryan Stone (Sandra Bullock) and Matt Kowalski (George Clooney) repair the Hubble Space Telescope (Credits: Warner Bros.). 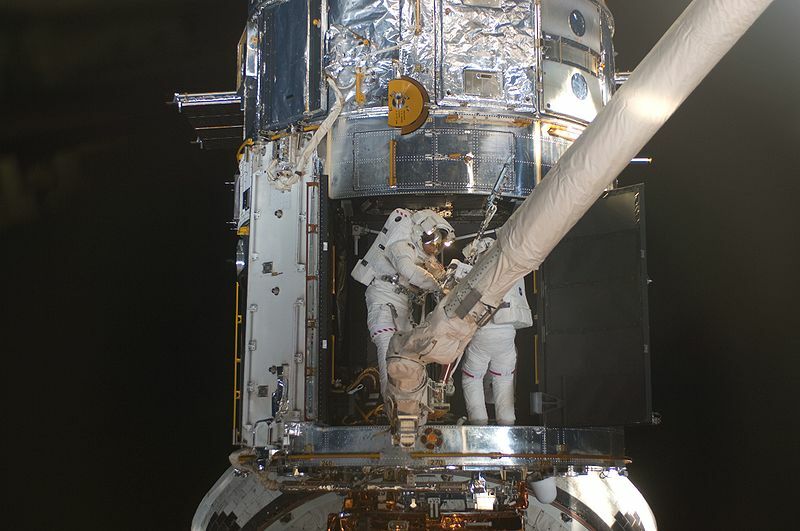 Astronauts Mike Massimino (right) and Michael Good repair the Hubble during STS-125 (Credits: NASA). “Gravity” astornaut Matt Kowalski (George Clooney) reaches to secure his tether during EVA (Credits: Warner Bros.). Take space debris, for instance. Orbital debris is a constant hazard to craft and crews, as evidenced from the bullet-like holes that appear in the International Space Station from time to time. That danger is actually exacerbated at the Hubble’s altitude. “Hubble’s 100 miles higher than the space station, so the debris field is much greater up there.” In fact, on Massimino’s STS-125 mission, the crew was careful to drop to a lower altitude as soon as their Hubble repairs were finished, even though they had several days left in space. 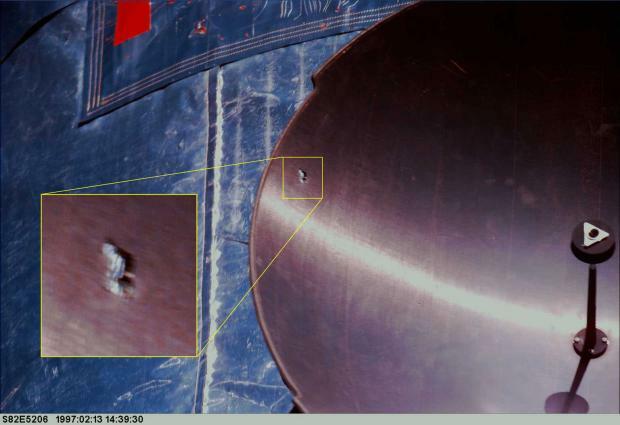 The hole in Hubble’s antenna where an orbital object stuck. “It was going pretty quick when it hit,” says astronaut Mike Massimino (Credits: NASA). Massimino and his crewmates were trained in how to respond to debris strikes while on orbit – whether that meant repairing their ship so they could reenter the atmosphere safely, or getting their EVA partner to safety after a depressurizing puncture in a spacesuit. But they were never presented with a scenario like the one in “Gravity.” “You don’t practice dying in the simulator,” Massimino noted. 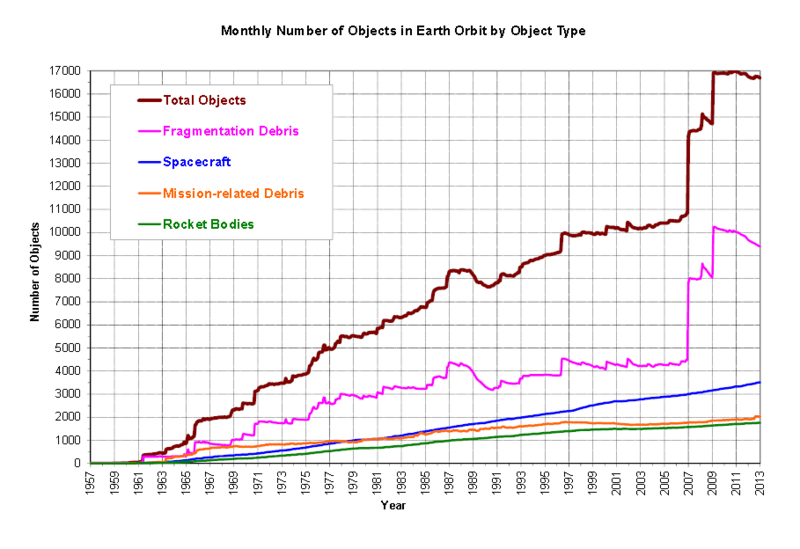 The population of orbital debris spiked in 2007 following an ASAT test (Credits: Orbital Debris Quarterly). A field of debris the size of that shown in “Gravity” taking out a Space Shuttle is pretty unusual…but not unheard of. An event much like the anti-satellite (ASAT) test shown in the movie actually took place in 2007 when China demonstrated its capabilities in that arena by shooting one of its defunct weather satellites, the Fengyun 1C. The United States responded by shooting down one of its old satellites, USA193. By the time they were done, there were over 3000 new debris objects, showing up as a sharp spike in debris population graphs. Although USA193 fell back to Earth, it is still necessary to dodge bits of Fengyun 1C on orbit today. Preventing such ASAT tests is one of the key drivers behind international efforts to establish a space code of conduct in which nations pledge to avoid ASATs or anything else capable of wreaking such havoc on orbit. Ryan Stone (Sandra Bullock) works on Hubble in the movie “Gravity” (Credits: Warner Bros.). You can see some of those consequences starting this weekend, in a theater near you. Image caption: The movie “Gravity” tells the story of two astronauts stranded in space after their Space Shuttle is destroyed by a debris impact during their EVA (Credits: Warner Bros.). Actually, such debris fields are unheard of and almost impossible. The debris field 100 km higher that ISS is more dense than at ISS altitude. Like one in a billion cubic per km compared to one in ten billion cubic km. why, because atmospheric drag burns things in. It would burn the ISS in if we did not keep boosting it back up. It was that low so that the shuttle could reach it. When the shuttle went away, the ISS was raised permanently so that we would not have to burn as often to keep it up. The article is slightly incorrect.